For more than two centuries the Oak Island Money Pit has baffled researchers and foiled treasure hunters, and when Dane Maddock and Bones Bonebrake take up the search, they get much more than they bargained for. Danger lies at every turn as they search for a treasure out of legend that dates back to the time of Christ. Ancient wonders, hidden temples, mythical creatures, secret societies, and foes new and old await as Dane and Bones unravel a pirate’s deadly secret in Buccaneer. 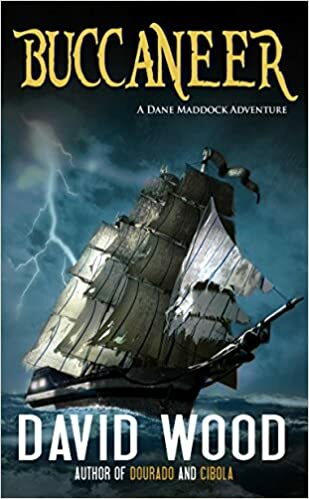 "David Wood delivers again in Buccaneer with a fast-paced romp through sunken treasure maps, hidden Templar churches and a secret organization that wants to resurrect an ancient kingdom. Dane Maddock and his sidekick Bones wisecrack their way through adventure, aided by Angel and Avery, two strong women who bring a romantic spin to this action-adventure chase. I loved the Cornish citadel with dragons guarding it and the echoes of Arthurian legend. Fantastic!" -J.F.Penn, author of the ARKANE thrillers.